HOW DO I PLACE AN ORDER FOR THE CUNNINGHAM PANEL™? We have a secure Prescriber Portal for you to register as a physician, place an order and retrieve and review the test results of your patients. You register and/or log onto the Prescriber Portal , place an order for the Cunningham Panel™ of Tests and submit the patient e-mail contact information and physical address at the time of order. Registering for the first time takes less than 5 min, as does ordering the Cunningham Panel of tests. Once you have registered the first time, subsequent orders simply require signing in with your chosen login information and ordering the Cunningham Panel™. Should you need help or assistance with signing up, please contact us at (405) 239-5250 and we will be glad to help you! HOW DO I RECEIVE CUNNINGHAM PANEL™ RESULTS? Patient results are uploaded to our secure Prescriber Portal and you will be notified by e-mail when results are available. Please allow approximately 3-4 weeks for completion of testing for all five test in the panel. These are high complexity clinical laboratory tests and we are working on new platform formats that will help to decrease the turn-around-time. Thank you for your patience. HOW LONG DOES IT TAKE TO RECEIVE CUNNINGHAM PANEL™ RESULTS? Due to the complexity of these tests and number of requests, we ask that you currently allow approximately 2-3 weeks turn-around-time for sample processing. We are working to significantly decrease the time of processing to enable you to more rapidly diagnose and treat your patients. Thank you for your patience! HOW DOES BILLING FOR THE CUNNINGHAM PANEL™ WORK? The cost of the Cunningham Panel™ of 5 tests is $925. Moleculera Labs will send an internet link via e-mail to your patient with a request for them to submit a deposit of $425 for the panel via credit card. The patient must provide their insurance information to us in order for us to bill insurance on their behalf (patient pay without insurance is $925). • If the patient pays the $425 deposit, then we will file the insurance on their behalf. • If the patient prefers to file the insurance themselves, then they will need to pay the full cost of $925, before we can send the specimen collection kit. • Insurance is filed once the test report has been released (typically 2 to 3 weeks after the specimen is received). • The date of service used to file the insurance is the specimen collection date (the date the specimen was drawn). • Moleculera Labs is considered an “out-of-network” provider for all insurance carriers. For improving insurance coverage we ask that patients contact their insurance carrier and request this test to be considered “in-network” as there are no other laboratories performing this panel. Unfortunately for now, if the patient has a government sponsored plan, such as Medicare, Medicaid, TriCare, etc., they will have to file the claim themselves. For more detailed information on insurance maximization visit this link: insurance and payment. HOW CAN I GET CUNNINGHAM PANEL™ KITS? Specimen Collection Kits are shipped directly to patients once their deposit payment of $425 has been made. They are shipped within two days of their deposit payment and are sent via FedEx 2-day air. If you will be doing the blood draw in your office and would like to have some Cunningham Panel™ kits on hand, you can order them by one of the following ways. 2. Call our office at (405) 239-5250. WHERE DO I SEND MY PATIENTS FOR THE BLOOD DRAW FOR THE CUNNINGHAM PANEL™? Many physicians have phlebotomists in their office or clinic. If that is not the case, local laboratories can complete the blood draw. We have found that local hospital labs are helpful, especially if the prescribing physician is associated with or has admitting privileges at the hospital. Each kit has very detailed instructions for the drawing, preparation and shipment of the specimen. We recommend that the patient call the laboratory they have chosen prior to going for the blood draw to ensure that the lab will draw blood for the Cunningham Panel™. Moleculera Labs has a listing of labs across the country that recognize our test kit. If your patient is having difficulty finding a lab, please have them call our office at (405) 239-5250 for assistance. WHAT IS REQUIRED FOR THE BLOOD DRAW FOR THE CUNNINGHAM PANEL™? Blood must be drawn into the two “red top” tubes provided, and the serum separated and transferred to the storage tube provided, and shipped with the cold packs (provide) frozen. The red top glass tube is the only tube validated for use with this panel. Blood collected in any other tubes must be rejected. In special cases where the blood cannot be centrifuged, alternatively, you can package the red top tubes with blood directly and we will process them after they arrive. Please be sure that samples are kept cold with the frozen cold pack. Specimens received warm will need to be rejected as we cannot be certain of the testing results. Please provide information for your patient as to the location of a phlebotomy laboratory where they may have blood drawn. *These directions are also included with each kit. CAN I ORDER THE CUNNINGHAM PANEL™ IN NEW YORK? Under New York regulations, practitioners in New York State may order the Cunningham Panel™ for their patients, but specimens must be collected at a facility outside the State of New York. At this time, Moleculera Labs is not licensed in the State of New York and as a result is unable to accept specimens collected in New York. Should you have any questions, please contact us at (405) 239-5250. WHERE CAN I FIND INFORMATION ABOUT TREATMENT OPTIONS FOR PANS AND PANDAS? We encourage you to visit the PANDAS Physicians Network , which is a scientifically based communication tool and information source developed by a multi-disciplinary group of physicians and researchers providing real-time information and support of physicians working with PANS and PANDAS children. The PANDAS Physicians Network (“PPN”) is an organization that is dedicated to helping medical professionals better understand PANS and PANDAS through real-time information and networking. Specialists from the top academic medical institutions in the United States who have worked with, treated, or studied the patients or aspects of the disorder, have agreed to serve on PPN committees or as special advisors. Because PANS and PANDAS are interdisciplinary disorders, all the relevant disciplines are represented on the PPN committees and the special advisory council. We encourage physicians, researchers and medical professionals to become members of the PPN in order to get updates on the latest research, treatments and developments as well as to communicate with like-minded professionals. The PANDAS Physicians Network will also link you to current research trials and studies including those of Dr. Madeleine Cunningham at the University of Oklahoma. DOES THE CUNNINGHAM PANEL™ TELL ME THE UNDERLYING INFECTIOUS AGENT? At present, the Cunningham Panel™ does not include testing for streptococcal or anti-streptococcal antibody titers in PANDAS. Additionally, it does not include testing for other possible infectious causes of PANS. Our goal at this time is to assist the physician by determining if there are elevated anti-neuronal antibodies and neuronal cell activating antibodies currently circulating in the blood, rather than attempting to identify the infection related to the autoimmune condition. WHAT OTHER DISEASE CONDITIONS CAN THE CUNNINGHAM PANEL™ HELP TO DIAGNOSE? The results from this 5-test panel are an indicator of whether or not a patient has autoimmune antibodies directed against neurologic proteins. Medical conditions that involve or affect the biological functioning of these specific receptors (anti-dopamine D1 and anti-dopamine D2L), and/or cell proteins (anti-tubulin and anti-lysoganglioside GM1) and/or stimulate the up-regulation of neurotransmitters (CaMKII) may likely be elevated in other conditions. Other neurologic or neuropsychiatric disorders may result from improper functioning of these same proteins. Physicians may find our 5-test panel results helpful in the diagnosis of these types of conditions. PLEASE NOTE: The Cunningham Panel™ is not a diagnostic test for PANS or PANDAS, but rather an aid to the physician when making a clinical diagnosis. PANS and PANDAS are currently diagnosed clinically, and this test is provided as an aid to the physician in making that diagnosis. HOW DO I INTERPRET THE RESULTS OF THE CUNNINGHAM PANEL™? Please call our office for specific information regarding testing results on your patients, as we are glad to be of any assistance. In general, the explanation of testing results is different from interpretation of results for a particular patient. We perform all 5 tests contained within this panel because we have found that children with PANS and PANDAS symptoms typically result in 1 or more of the 5 different test results falling outside of the normal range. If the results of 1 or more of the 5 test results exceed the normal range, we consider this to be an indicator that there may be some degree of an underlying autoimmune neurologic condition. We have multiple patient case studies that correlate the presence of symptoms with the presence of elevated antibody titers against these neurologic targets. In these same patients, we find that resolution of symptoms correlate with the absence of elevated antibody titers against these neurologic targets. We are collecting data to determine if there is any correlation between symptom severity and higher levels of titers within any individual test, or whether symptom severity is greater when more than 1 test result is elevated. We do not yet know if the absolute titer level is correlative with symptom severity. If you would like to know about these and additional data on these studies please contact our laboratory and we will be happy to share more information with you. WHAT WILL THE CUNNINGHAM PANEL™ TELL ME THAT OTHER TESTS DON'T REVEAL? CAN I ORDER THE CUNNINGHAM PANEL™ FOR MY ADULT PATIENTS? Yes. We do have the ability to test and report results on adult patients. Currently, the normal titer ranges for our 5-test panel were determined in normal pediatric populations, therefore at this time we do not know whether the normal and elevated ranges would be identical in adults. However, you may find that the general results of each of the autoimmune neurologic titers may be helpful when determining a diagnosis and treatment for adults with neuropsychiatric symptoms. WHAT OTHER NEUROLOGIC TARGETS ARE BEING STUDIED? Research and development aimed at identifying additional test markers for PANS and PANDAS is ongoing. Moleculera Labs currently performs clinical testing to aid physicians in the identification of autoimmune neuropsychiatric conditions such as PANS and PANDAS. 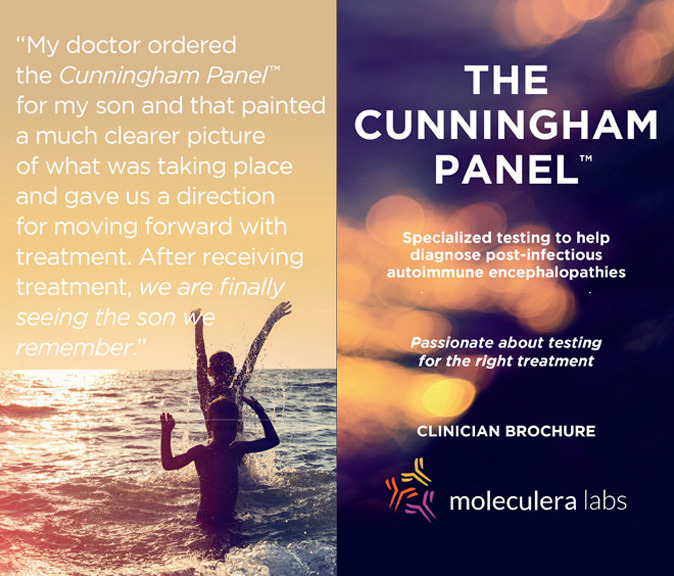 The Cunningham Panel™ of tests detects the presence and functionality of anti-neuronal autoantibodies associated with OCD, motor tics, and other neuropsychiatric manifestations. Because these symptoms can vary from patient to patient, we are examining whether there are additional neuronal targets, other than the current five in our panel, which may help explain the heterogeneity of symptoms in patients. Additional autoimmune targets may better identify and characterize PANS and PANDAS patients, and help refine treatment decisions for physicians when managing their patient’s therapy. Regarding test markers for other neuropsychiatric disorders, scientific and medical literature have well-established links between inflammation and psychological disturbances. Various studies show that markers of inflammation are associated with increased incidence of neurologic symptoms. Inflammation is a normal part of the immune system response. We are researching whether there is an association between autoantibodies against other neuronal antigens, and the clinical diagnosis of neuropsychiatric disorders such as chronic depression, bipolar disorder and schizophrenia. Currently we are examining a number of candidate neuronal and neuropsychiatric targets that impact normal neuronal functions. Our goal is to develop additional testing panels that would identify whether patients suffering from these other neuropsychiatric conditions may be responsive to autoimmune therapy rather than treatment with neuropsychiatric drugs. WHAT SYMPTOMS COULD ALERT ME TO CONSIDER PANS AND PANDAS? In more chronic cases, clinicians may see seemingly unrelated symptom clusters in the patient who is not responding to treatment as the clinician would expect. This is a link to the NIMH PANS and PANDAS symptom listing. WHY WERE THESE NEUROTRANSMITTERS CHOSEN TO BE INCLUDED ON THE CUNNINGHAM PANEL™? Each of these neuronal antigen targets were chosen because of a correlation with symptoms of neuropsychiatric behavior. Many targets were originally screened and tested, and did, or did not, show significance. The tests we selected include the four (4) autoimmune neurologic targets (anti-dopamine D1, anti-dopamine D2L, anti-tubulin and anti-lysoganglioside) which are highly concentrated in neuronal cells in the brain and have involvement in neuropsychiatric and/or motor movement activity. The fifth assay, CaMKII (Calcium-dependent Calmodulin Protein Kinase II) is a cell stimulation assay in which human serum is incubated on human neuronal cells. The increase or stimulation of CaMKII activity by serum antibodies is measured compared to a baseline control. CaMKII is involved in the up-regulation of many neurotransmitters in the brain. We currently are researching additional autoimmune targets that may be involved in other neuropsychiatric disorders. Our future research includes understanding if a portion neuropsychiatric conditions such as chronic depression, schizophrenia, and bipolar disorder have an underlying but treatable autoimmune basis.